Good afternoon. 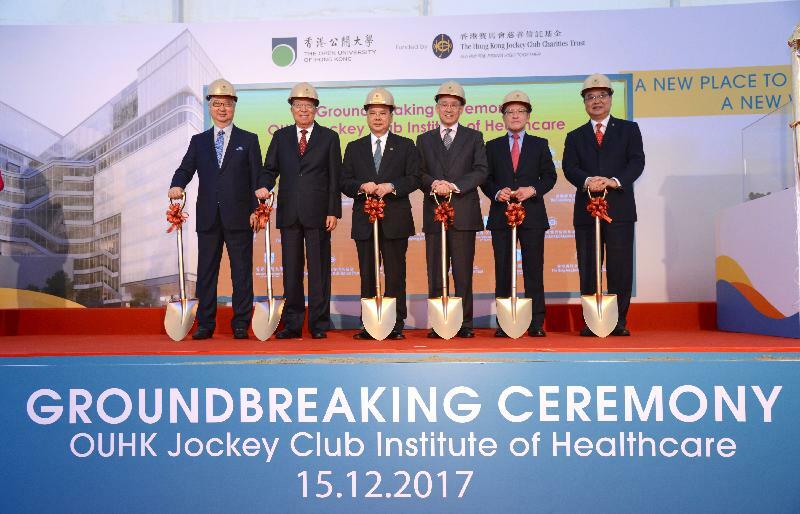 I am delighted to join you today for the Groundbreaking Ceremony of the Open University of Hong Kong Jockey Club Institute of Healthcare. The Open University's roles and responsibilities, not to mention its size and ambitions, have grown remarkably since its establishment in 1989, as the Open Learning Institute of Hong Kong - the first university that offered open and distance education in Hong Kong. In less than a decade, it enjoyed full university status and was retitled in 1997 as the Open University of Hong Kong. Today, the University provides about 220 programmes to over 9 500 full-time students and 9 500 part-time students in an impressive range of offerings, from sub-degree to postgraduate. Among others, healthcare has been among the University's signature programmes since its Division of Nursing and Health Studies was established in 1994. The Division offers 12 programmes for more than 3 200 full-time and part-time students. It has proudly groomed more than 7 000 nurses, serving in more than 50 hospitals and other healthcare organisations across Hong Kong and around the world. Today's groundbreaking ceremony makes it abundantly clear that we can expect a great deal more from the Open University and its Division of Nursing and Health Studies. 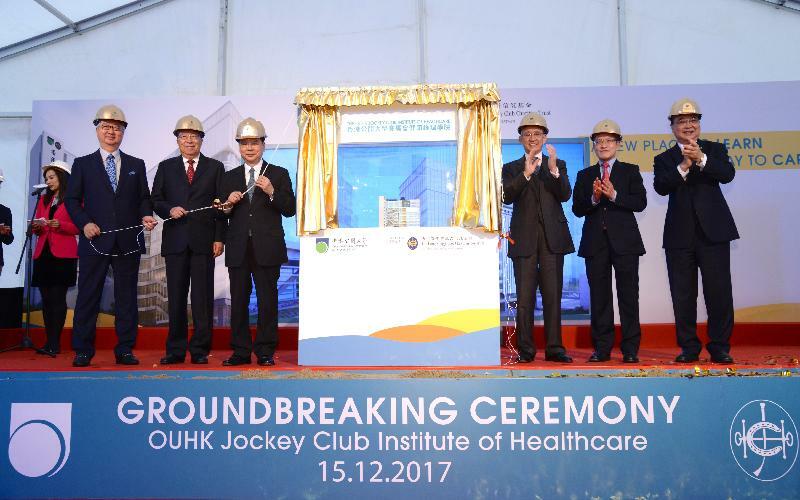 Thanks to the generous donation of $281 million from the Hong Kong Jockey Club Charities Trust, the Jockey Club Institute of Healthcare which is scheduled to open in 2020 will rise as another major milestone for the Open University and Hong Kong. About 1 200 students will benefit from the 13-storey complex that will feature state-of-the-art healthcare training facilities and purpose-built laboratories for students of different disciplines including nursing psychology and physiotherapy. The new Institute will be the new home for various healthcare programmes including five proposed new ones under planning, covering early childhood education, mental health and psychology, physiotherapy, dietetics and occupational therapy. Given the rapidly ageing population and the long-term demand for healthcare services in Hong Kong, we definitely need to nurture more expertly trained professionals to respond to public expectation arising from these demographic changes. I know that we all much look forward to the opening of the new Institute. Indeed, the self-financing post-secondary education sector has been a very close partner of the Government in realising our vision of providing diverse and quality education options to young people. In particular, the Open University has long responded to our calls for programmes that address the significant manpower needs of specific industries and areas. In return, the Government has spared no effort in making those programmes a reality in various ways, including the Study Subsidy Scheme for Designated Professions/Sectors. It provides an annual subsidy of up to $70,000 for students to pursue select, self-financing undergraduate programmes to boost talent in designated fields. This year, more than 300 new students are benefiting from the Scheme in four Open University programmes, including general healthcare, mental healthcare, animation and visual effects as well as testing and certification. In the 2018/19 academic year, we will provide subsidies to students in 12 Open University programmes and two of which are nursing programmes that will provide 340 subsidised places. The construction of this new complex is therefore timely to complement the University's efforts in strengthening education and training in the healthcare sector. The Government's commitment in supporting the self-financing, post-secondary education sector is further illustrated by the fact that, despite the current state of play in the Legislative Council, we are seeking approval from its Finance Committee for OUHK's application for a $400 million interest-free loan from the Government's Start-up Loan Scheme for developing the Jockey Club Institute of Healthcare. Another prominent example is that we have implemented the non-means-tested subsidy scheme for students pursing self-financing undergraduate degree programmes in Hong Kong to enhance support for students of self-financing institutions. The task force led by Professor Anthony Cheung is now reviewing how the Government can better support the sector to ensure its healthy and sustainable development. On this encouraging note, I would like to express my deepest appreciation to the Hong Kong Jockey Club Charities Trust as well as those who have contributed to this project for your unfailing support for healthcare education in Hong Kong. 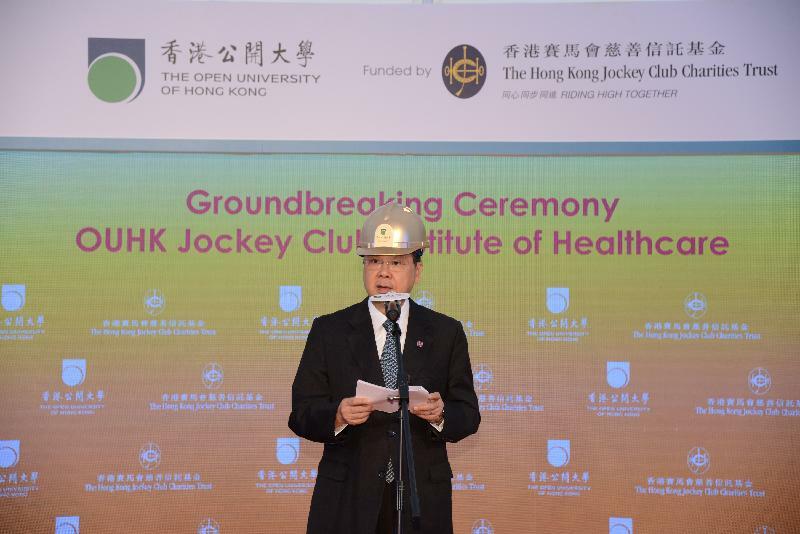 I look forward to witnessing with you in some three years' time the grand opening of the Open University of Hong Kong Jockey Club Institute of Healthcare. For now, I wish you all happy holidays ahead of us and a merry Christmas, and a healthy, happy and harmonious 2018 - in and out of the classroom. Thank you.